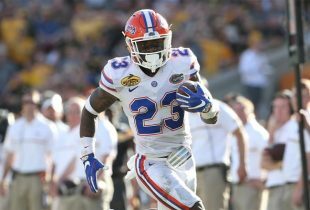 Five-star 2011 athlete De’Ante “Pop” Saunders of DeLand High School has verbally committed to the Florida Gators, according to the Orlando Sentinel. One of the top players in the nation, Saunders received a written scholarship offer via fax at DeLand and immediately called defensive coordinator Charlie Strong to commit to the Gators. Keep the ball rolling! The future is ALWAYS bright at the University of Florida!! !